Bath’s Fashion Museum is fifty this year and what a little gem we have tucked away in the basement of the Assembly Rooms. Though it does come ‘upstairs’ from time to time. 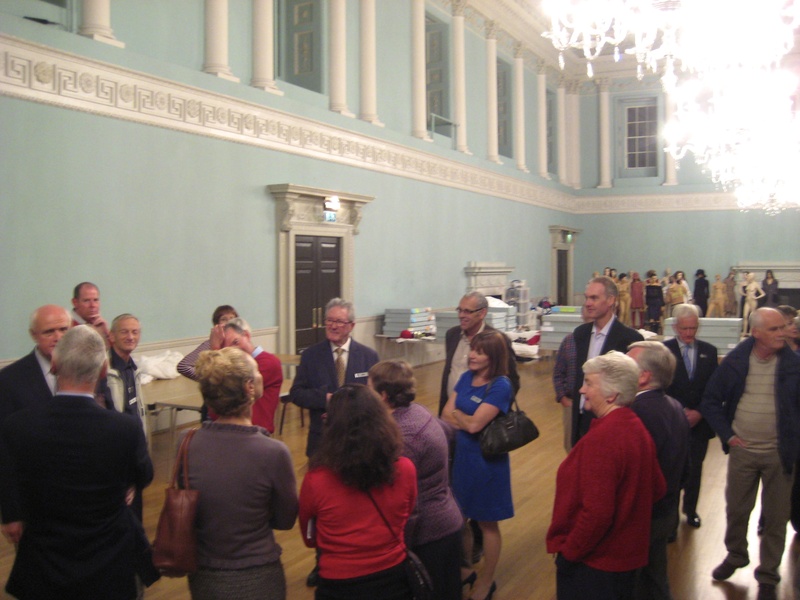 During the summer staging a celebration of Laura Ashley fashion in the ballroom and – this week – part of the collection was being photographically catalogued under those sparkling chandeliers while members of the Mayor of Bath’s Corps of Honorary Guides were getting a special back-stage tour of John Wood Junior’s upper palace of entertainments started in 1769. 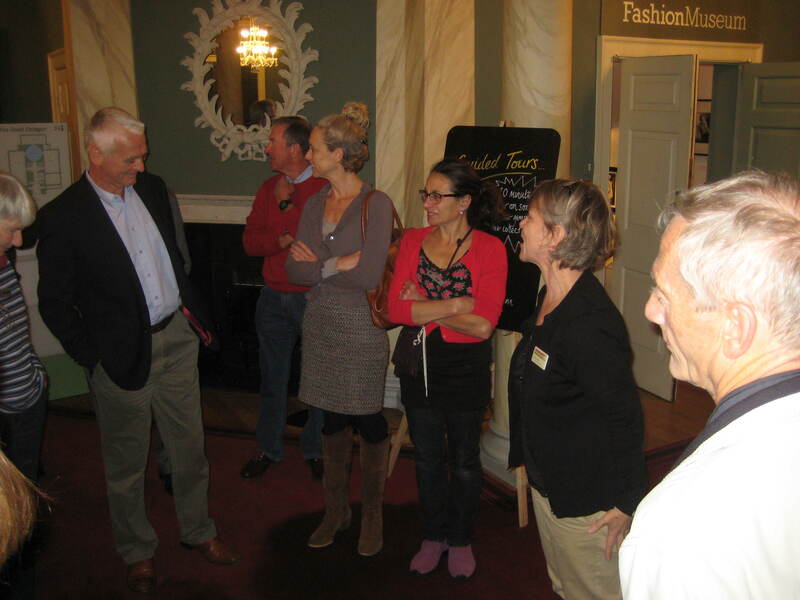 Fashion Museum manager Rosemary Harden talking to Mayor’s guides. Fashion Museum manager Rosemary Harden told us there were around one hundred thousand items in the collection and obviously – as with all museums – what the public sees is only the tip of the iceberg. With additional items constantly trickling in its amazing where everything is stored and you can see how cataloguing is of itself a full-time job. It was interesting to hear that Roy Strong – former Director of the V&A – has donated some of his personal wardrobe to the collection. He is a man with quite a reputation for being a modern ‘beau’ and a celebrity in his own right. There was also a hint of an exhibition to come. Preparations already started for ‘The Georgians’ which will open in January 2014. Finding room for things is always an issue here and the Virtual Museum would love to see the Fashion Museum being allowed a permanent presence on the ground floor as a taster and entrance way to the treasures below. Currently the way down is just a name above a doorway. Also what about exhibitions that might feature costumes from the BBC”s Strictly Come Dancing or – as 2014 will be marking the start of World War One – an exhibition featuring military costume? Maybe there are other venues in Bath that could tie in with the Fashion Museum and offer space for a satellite exhibition? It’s a thought. Heritage Manager Stephen Bird showed the guides around the ballroom and grand tea room and really did give us a ‘Bird’s-eye’ view of those exquisite chandeliers as we were allowed up on to the musician’s balconies. Quite a vantage point to look down on these fine examples of Georgian London-made cut-glass lead-crystal creations that thankfully were removed before the war and not damaged by the Assembly Rooms being gutted in 1942. Chandeliers in the tea room. 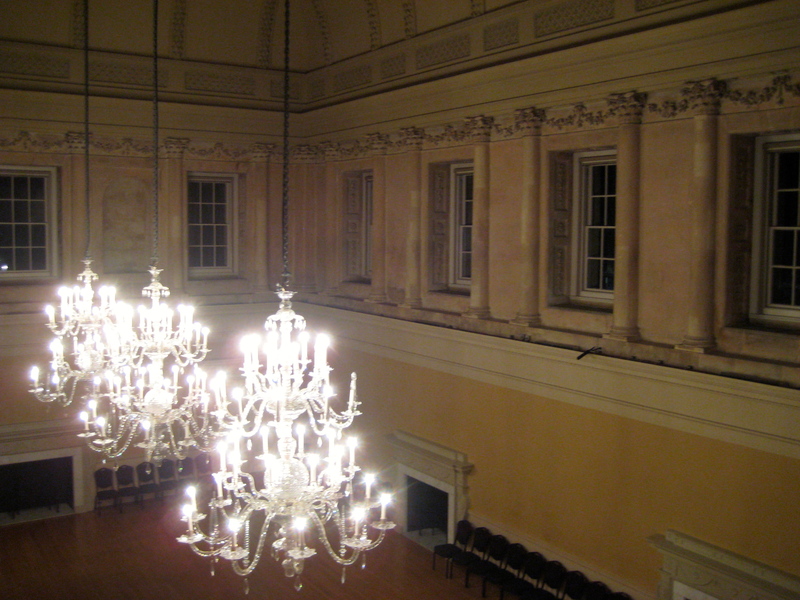 Guides tell the story of how the celebrated artist Thomas Gainsborough narrowly escaped death or at least serious injury when part of a chandelier broke off and fell to the floor during a ball that he was attending. How history may have had to be re-written.